The arts have an incredible power to pull an audience into an idea, a vision, another dimension. And there is, arguably, no form of art more immersive than architecture. Recently, I’ve become much more aware of the importance of architecture. Through a Civil Engineering & Architecture class at my school and an Orientation to Architecture course at community college, I’ve realized how influential the subject really is. 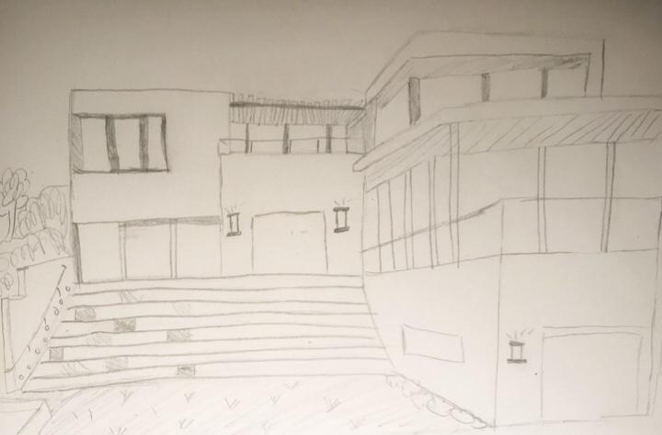 Above is a freehand sketch I completed for the college course. Architecture is the practice of designing/constructing buildings and related spaces for people to use and occupy. There’s an architect behind every skyscraper, every tourist attraction, every home. But architecture is more than glamour and grandeur. It surrounds us everywhere in public and private places. Our experiences are largely defined by the amount of care and attention to detail that architects put into their work. I recently watched a Ted Talk by architect/author/entrepreneur Mark Kushner. He tells the story of how his childhood home was designed in such a way that he had no privacy when walking from the bathroom to the bedroom. The poor planning of the space forced him to walk past his entire family watching television as he exited the shower in his bathrobe. That daily walk was humiliating. He felt exposed. He felt watched. That daily walk made him loathe his own home. “Americans spend 90% of our time indoors,” he says. As such, it’s incredibly important that the places we reside in our comfortable, functional, and sustainable. If not, a good chunk of our lives can become defined by uncomfortable emotions. As we move into the age of climate change, architects will also need to become more intentional about how their designs integrate with the surrounding space and the world at large. I am fascinated and inspired by Kushner’s approach to architecture. I like his idea of “evolution vs revolution”, in which it is better to allow things to evolve-- to gradually evolve and adapt to the surrounding world. This allows urban development to occur in harmony with nature, and often even create nature, rather than harm it. He compares the architectural process to Darwin’s theory of natural selection by describing “architectural selection” as a process that helps them to choose the best design out of a medley of ideas. Kushner comments that, as an architect, he never throws an idea out. Every idea is valuable, even if it doesn’t solve the issue at hand. However, he focuses on projects that seamlessly blend architecture with reality. His work is environmentally conscious, functional, and aesthetically pleasing. My favorite design of his is the carbon-neutral island in Central Asia. His team essentially designed a brand new ecosystem that works in harmony with the environment and replicates the mountains. Although it seems like something out of science fiction, it’s incredible to see a project of that scale come to life. So next time you take a step into a building, walk into a public pavilion, or even just walk from the bathroom to the bedroom, thank an architect.